The caliphate has crumbled, and the final offensive is over. While the official announcement hasn’t yet been made – Fox News has been told that this village, the last ISIS stronghold, is liberated. It’s the first time since we’ve been here in Syria for five days that the bombs have stopped dropping and the gunfire has disappeared. We have witnessed the end of the caliphate – the brutal empire that once ruled over 8 million people – is gone. …None of the main surviving ISIS leaders have been caught inside Baghouz. Instead, they left their men to fight alone. It’s thought they prepared ahead for the insurgency. The scale of the devastation here is incredible. And everyone acknowledges that without U.S. support, it would have taken far longer. For four-and-a-half years, ISIS held this territory, ruling over it with an iron fist. It was the terrorist group’s heartland – and they were so dug in that the only way to push them back was to flatten whole villages. The devastation here goes on for miles – and craters like this are a reminder of the critical role played by U.S. airpower. Military jets still fly overhead. SDF fighters are all so grateful to the U.S., not just for their help in the battle, but now for its decision to leave troops here when it’s done. Reports now suggest the figure may be around 1,000 staying. We need to leave enough of a force to prevent ISIS from reassembling. As the article stated, the leaders fled and left the lower ranking members to fight. That means the leaders are still somewhere, possibly plotting how to take power again. I don’t want to fight the battles for all of the people in the Middle East, but if our assistance means that the bad guys will lose power, I think we need to be ready to assist. There is a bit of a dust up right now within the Democrat Party as to how to handle some recent anti-Semitic remarks by Representative Ilhan Omar of Minnesota. Unfortunately this is not the first time in this Congress that anti-Semitic remarks have been made. The difference is that some of the new Congressmen are not willing to condemn those remarks. Speaker Pelosi., with her eye on retaining Democrat control of the House of Representatives, is in the difficult position of harnessing the energy of the new Representatives while not alienating Jewish voters who generally support Democrats. But we need to take a look at where we are and how we got here. Ilhan Oman represents the 5th Distict in Minnesota, which includes Minneapolis. Which brings us to Little Mogadishu, in the city soon to be formerly known as Minneapolis, where the good people of Minnesota — of Scandinavian, German, and Irish stock — have been busily importing people from perhaps the most culturally alien region of the world, Muslim East Africa, whose charming natives are unlikely to follow the traditional immigrant path outlined above. In Charles Dickens’s masterpiece, Bleak House, Mrs. Jellyby ignores her own brood while busily organizing aid to Africa; today’s Mrs. Jellybys have instead have brought East Africa to them. …A group of Somali volunteers including Abdirahman Mukhtar, left, and Abdullahi Farah gave out pizza and tea to young people from a stand Friday in the Cedar-Riverside neighborhood.The men hope by connecting with youth and engaging them in conversation they can combat the shootings that have recently plagued the neighborhood. After the latest spasm of gang violence, Minneapolis’ Somali residents and business owners on Monday stepped up their calls for help from City Hall and police headquarters to help curb the senseless shootings that they say too often go overlooked. On Friday alone, five men of Somali descent were shot in separate attacks, one fatally. The Somali immigration is largely the result of United Nations policies. This is the district Ilham Oman represents. The Somali population has not assimilated. It has brought Somalia with it. She represents the views of the people who live in her district. Representative Rashida Tlaib, another freshman in the House of Representatives, has come out in support of Representative Oman. Representative Tlaib represents Michigan’s 13th Congressional District. The district includes parts of Detroit and surrounding areas. The district is largely Muslim. So how did Michigan become a Muslim enclave in America? Michigan radio posted an article in 2014 that explains the Michigan demographic. There’s a legend in the local Yemeni community that Henry Ford once met a Yemeni sailor at port, and told him about auto factory jobs that paid five dollars a day. The sailor spread the word, leading to chain migration from Yemen and other parts of the Middle East. We don’t know if that chance encounter ever really happened. But we do know that in the early days, Ford was more willing to hire Arabs than some other immigrants—or African-Americans. And they did seem to follow Ford. A new Arab community, one that now included many Muslims sprung up around his first factory in Highland Park. In fact, the first purpose-built mosque in the US was located in Highland Park. But that community only lasted for a few years. “As Henry Ford then moved, and opened a new factory, the Rouge plant, in Dearborn, the Arab Americans followed him there,” Stiffler says. Plenty of Arab Americans worked outside the auto industry, though. As Detroit’s population boomed, so did a need for grocery stores. In the 1920s, Arab Americans ran hundreds of them. Stiffler says that created an enduring—and visible—commercial legacy. The two main Representatives that have come out in support of Representative Oman are Representative Tlaib and Representative Ocasio-Cortez. Note that all three are freshmen in Congress and may not yet be aware of some of what goes on behind the scenes. I suspect a lot of Democrat campaign money comes from the Jewish community and Speaker Pelosi may be trying to keep that money coming while keeping younger voters in the Democrat party. While the Democrats squabble about what to say about anti-Semitism in their party, Representative Oman sits of the Committee on Foreign Affairs. That, at least, needs to change. There will be an attempt to impeach President Trump within the next few months. It will happen as soon as the Democrats can actually come up with some sort of charges. However, the ground work is currently being laid–in the Senate. Mitch McConnell has lined up the Senators he will need by undermining the President’s decision to pull many of our troops out of the Middle East. Pay attention to which Senators voted to undermine the President in taking troops out of the Middle East. Those are the Senators who will be called upon to vote for impeachment. Also, note that a lot of people make money when our troops are overseas. Those are the people making large campaign contributions to those opposing the President. The Senate passed an amendment yesterday demanding that President Trump keep American troops actively engaged in war in the Middle East. The cloture vote in favor was 68-23, which includes 43 Republicans. Think of it. Most of our Republican Senators are in favor of continuing USA war presence in Afghanistan and Syria. Why? It finally passed by a majority of 70 to 26 — opposed by only three of the 53 Senate Republicans. According to AFP/Yahoo News, the amendment will eventually be incorporated into a broader security law on the Middle East. The Senate finally flexes their muscles and who do they attack? The President of their own party. It seems to me that if the Senate disagrees with President Trump and wants US forces to remain in Afghanistan and Syria, why don’t they just formally declare war? Unfortunately, this is just the beginning of the deep state’s nuclear attempt to get President Trump out of office before America realizes that he is actually accomplishing things that are making their lives better. 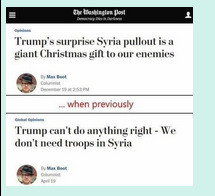 In all honesty, I have no idea whether or not it is a good idea to bring home troops from Syria. It does seem to me that we have been fighting in the Middle East since 2001 and have accomplished little. The definition of insanity is doing the same thing over and over again and expecting different results. That is a fairly accurate description of the wars we have been fighting in the Middle East. A new approach is needed. I am not sure what that new approach will be, but obviously the last approach is not working very well. Meanwhile, the tweet above is what blind opposition to President Trump looks like. Reuters posted an article today reporting that Hungary’s Prime Minister Viktor Orban has decided not to sign the Global Compact For Safe, Orderly and Regular Migration. The agreement was approved on Friday by all 193 U.N. member nations except the United States, which pulled out last year. Hungary, along with Poland and Czech Republic, has taken a tough stand against the admission of migrants, putting it at odds with the European Union, but striking a chord with voters by arguing that irregular immigration threatens European stability, and fencing off Hungary’s southern borders. Szijjarto said the U.N. pact was “extreme, biased and facilitates migration. France, Germany, and Sweden have all experienced drastic increases in crime due to the influx of immigrants from Muslim countries. Unless the immigrants are willing to assimilate (and most of them are not), the attitudes of the immigrants towards women and other western cultural norms have been a problem. Hungary has recognized this and acted accordingly. The solution to the massive migration to Europe from Africa and the Middle East is for the people in the African and Middle Eastern countries to clean up their act. Generally speaking, in the countries the migrants are coming from, the wealth and the law are controlled by a select group of people in charge. I don’t blame these people for fleeing, but they need to stay and fight. If you look at the pictures of the migrants, the majority of them are men between the ages of about eighteen to thirty-five. They are fleeing rather than joining together to fight for economic (and other) freedoms. I wonder if these migrants were forced to remain in their home countries if they would be willing to fight for those countries. 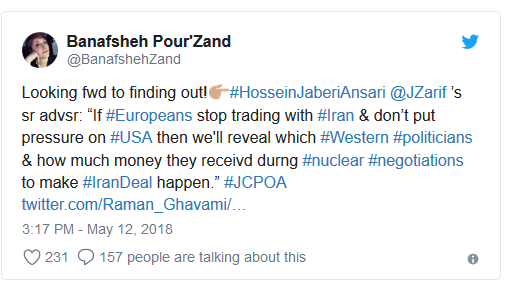 The Gateway Pundit posted an article yesterday about a recent statement by Iran’s Foreign Ministry Spokesman Hossein Jaberi Ansari. Hossein Jaberi Ansari has told Western officials that if they do not pressure President Trump to reconsider withdrawing from the Iranian nuclear deal, he will release the names of the people who were bribed to pass the deal. This is truly a get-out-the-popcorn moment. In September 2016, The Federalist posted an article about the Arab Spring. The Arab Spring began as a movement that was supposed to bring freedom to some of the dictatorships in the Middle East. Unfortunately, what it brought was governments controlled by the Muslim Brotherhood and the attempted implementation of Sharia Law. Egypt is a prime example of that although they were able to get out from under the rule of the Muslim extremists. The “Arab Spring,” as it was dubbed, was a series of protests across the Middle East that initially showed a growing resistance to tyranny and oppression of dictators throughout the region. In a rare regional uprising, the people of the Islamic world seemed to have had enough with dictatorship and oppression. Only, they didn’t get freedom when they toppled these dictators. The article notes that Glenn Beck (during his last month on Fox News) predicted the rise of the Islamic Caliphate. He was mocked for this prediction, which turned out to be accurate. The article at The Federalist shows the role that Hillary Clinton played in the destabilization of the Middle East that led to the rise of the Islamic Caliphate. The article includes a memo detailing her involvement. The United States government is believed to have utilized a program called the Alliance of Youth Movements Summit, co-founded by a close Hillary Clinton adviser, to provide networking opportunities for an activist plotting to overthrow Egyptian leader Hosni Mubarak several years before the “Arab Spring” protests that led to widespread regime change in the Middle East. Through the Alliance of Youth Movements Summit, the U.S. learned that the Muslim Brotherhood was supportive of a plan to overthrow Mubarak. The U.S.-supported Muslim Brotherhood later briefly ruled Egypt after Mubarak’s ouster. It is important to recognize that the program was created before Clinton took office as Secretary of State, but she continued with it, and apparently not in a way that promoted peaceful protest in the region. On November 18, 2008, two weeks after Barack Obama was elected U.S. president, the U.S. State Department announced the first Alliance of Youth Movements Summit at Columbia Law School in New York City. A permanent group called the Alliance of Youth Movements (AYM) was developed by Summit leaders after the first Summit convened. Bush State Department official Jared Cohen, listed as the “international press contact” for the Summit, described some goals of the conference before it convened in December. Please follow the link above to read the entire article. It includes other information related to America‘s actions in the Middle East under President Obama. It does not paint a pretty picture. Yesterday Fred Fleitz posted an article at The Center For Security Policy website about the ongoing protests in Iran. 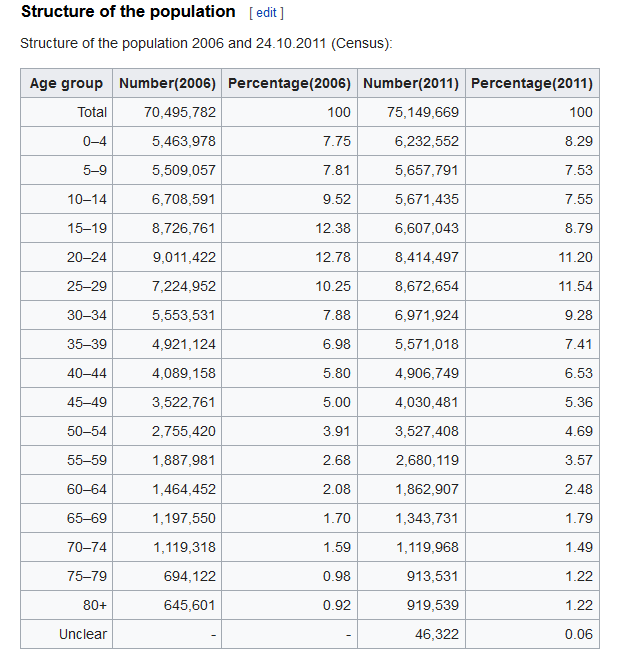 As you can see from the chart (although it is a few years old, the numbers are basically accurate), the largest percentage of the Iranian population is between the ages of ten and thirty-five. This group of people has no relationship with the Islamic revolution that took place in Iran in 1979–most of them were not even born then. The younger Iranians look with envy at the western world–they do not appreciate the rules of the mullahs. It is only a matter of time before the mullahs die out and the young people take over. I am not sure that democracy is possible in Iran after all they have been through, but there will come a time when a revolt leads to a more free society and hopefully one without nuclear ambitions. It is telling that Iranian security is reluctant to fire on the protesters. That might be the result of the mullahs not wanting to create martyrs or it might be a reaction to the fact that the mullahs no longer have a friend in the White House. There are some positive aspects of the fact that many countries consider President Trump a loose cannon. Politico is not a right-wing website. Generally, it leans left. So why are they throwing President Obama under the bus? I don’t know, but Politico posted an article yesterday detailing how the Obama Administration blocked an ambitious law enforcement campaign targeting drug trafficking by the Iranian-backed terrorist group Hezbollah, even as it was funneling cocaine into the United States. This is part of the price President Obama was willing to pay to get the Iranian nuclear treaty. The article at Politico is long, but it is worth reading. I will try to summarize the main points, but I strongly suggest that you follow the link above to read the entire story. …Project Cassandra, was launched in 2008 after the Drug Enforcement Administration amassed evidence that Hezbollah had transformed itself from a Middle East-focused military and political organization into an international crime syndicate that some investigators believed was collecting $1 billion a year from drug and weapons trafficking, money laundering and other criminal activities. Over the next eight years, agents working out of a top-secret DEA facility in Chantilly, Virginia, used wiretaps, undercover operations and informants to map Hezbollah’s illicit networks, with the help of 30 U.S. and foreign security agencies. They followed cocaine shipments, some from Latin America to West Africa and on to Europe and the Middle East, and others through Venezuela and Mexico to the United States. They tracked the river of dirty cash as it was laundered by, among other tactics, buying American used cars and shipping them to Africa. And with the help of some key cooperating witnesses, the agents traced the conspiracy, they believed, to the innermost circle of Hezbollah and its state sponsors in Iran. But as Project Cassandra reached higher into the hierarchy of the conspiracy, Obama administration officials threw an increasingly insurmountable series of roadblocks in its way, according to interviews with dozens of participants who in many cases spoke for the first time about events shrouded in secrecy, and a review of government documents and court records. When Project Cassandra leaders sought approval for some significant investigations, prosecutions, arrests and financial sanctions, officials at the Justice and Treasury departments delayed, hindered or rejected their requests. The article quotes someone involved in the investigation as saying that the program was blocked from the top. Obama had entered office in 2009 promising to improve relations with Iran as part of a broader rapprochement with the Muslim world. On the campaign trail, he had asserted repeatedly that the Bush administration’s policy of pressuring Iran to stop its illicit nuclear program wasn’t working, and that he would reach out to Tehran to reduce tensions. Anyone who knows the history of Lebanon understands that Hezbollah is not a force for peace, freedom, or stability. The article goes on to detail money laundering by Hezbollah and the fact that Hezbollah has operatives in America planning terrorist attacks. It is very obvious in reading the article that the activities of the Obama Administration put Americans at risk. The efforts at ending the drug trafficking and money laundering will resume under the Trump Administration. At a time when America has major drug problems, it would be a really good idea to shut down any traffickers we can. Yesterday the U.K. Daily Mail reported that Saudi Arabia had shot down a missile from Yemen aimed at one of the kingdom’s major international airports on the outskirts of Riyadh. Saudi Arabia said its forces intercepted a ballistic missile fired by Iran-backed rebels in Yemen toward one of the kingdom’s major international airports on the outskirts of Riyadh. A Saudi-led coalition launched a war against the Houthi rebels and their allies in March 2015 that grinds on today, a campaign overseeing by Crown Prince Mohammed. 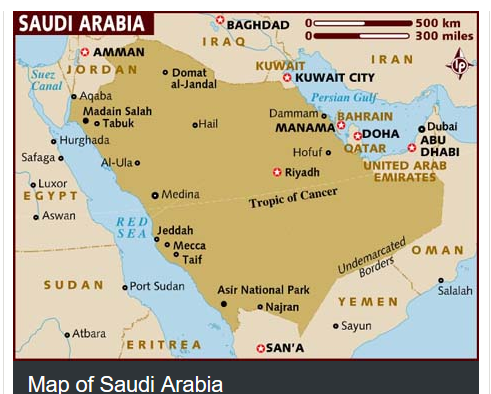 The conflict between Iran and Saudi Arabia is an expression of the Sunni vs. Shiite conflict. Both the Sunnis and the Shiites want a caliphate reminiscent of the Ottoman Empire covering the Middle East. The dispute is over who will lead it–the Sunnis or the Shiites. Only hours before the missile was shout out of the sky, Lebanese prime minister Saad Hariri resigned from his post in a televised address from Riyadh, offering a vicious tirade against Iran and its Lebanese proxy Hezbollah group for what he said was their meddling in Arab affairs. ‘Iran’s arms in the region will be cut off,’ Hariri said. Iran-backed Yemeni Huthi rebels claimed responsibility for firing missile, which was targeting the airport, the Huthis’ Al-Masirah television said. Yemen, Saudi Arabia’s southern neighbour, has been ripped apart by a war between the Saudi-backed government of president Abedrabbo Mansour Hadi and Huthi rebels backed by Iran. A Saudi-led coalition became involved in 2015 to help prop up Hadi’s government after Shiite Huthis seized the capital Sanaa. The missile was knocked down by the Patriot missile system that the Saudis bought from America. As Iran has become more powerful in the Middle East, the persecution of Christians has increased. Unfortunately, the Islamic religion does not include tolerance for those who do not practice Islam. In the past, our efforts to provide relief for persecuted Christians has been filtered through the United Nations, an organization that has tended to look the other way when Christians were persecuted. One of the major voting blocs in the United Nations is the Organisation of Islamic Cooperation (OIC). That organization believes that Christianity is blasphemy against Islam and that Christians should be persecuted. The OIC is actually a major player in deciding how and where money for humanitarian aid to refugees and persecuted people should be spent. One America News is reporting today that the Trump administration is changing the way humanitarian aid to persecuted Christians is handled. Hopefully this change will mean the persecuted Christians receive the necessary aid. 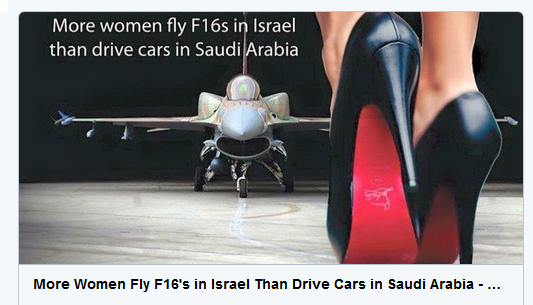 The Middle East is a tough neighborhood. Aside from the basic political unrest, there seems to be constant news of terrorist attacks and innocent people being murdered. The brutality of the region seems to be part of the culture. There are aspects of American culture that can be violent, but we have not accepted those elements in quite the same way. PJ Media posted an article today about some recent events in the Middle East and one man’s reaction to those events. In December, the Islamic State claimed a suicide bombing in a church inside Cairo’s Coptic cathedral compound that killed 29 (all but one were women and girls). On Palm Sunday, two separate Islamic State suicide bombings killed nearly 50 worshippers. The Muslim Brotherhood was formed in Egypt in 1928 and has been a problem for Egypt ever since. Egypt’s President, Abdel Fattah el-Sisi, has tried to keep the Muslim Brotherhood in check since he took office. Obviously, he has not been totally successful. It is somewhat annoying to me that some Americans in the last administration were extremely sympathetic to the Muslim Brotherhood. One in particular posted some strange tweets. Reading ISIS’s latest mag “otherizing” Egypt’s Copts. Subhanallah how what goes around comes around. Coptic ldrs did same to MB Egyptians. What has Elibiary upset? Many in the Coptic Christian community backed the removal of the Muslim Brotherhood’s Mohamed Morsi in 2013. In his tweet, he references “MB Egyptians” — Muslim Brotherhood Egyptians. During the time Morsi was President of Egypt, Christians were relentlessly persecuted. Although the persecution has somewhat abated under el-Sisi, it does continue. The Coptic Christians are one of the oldest branches of Christianity in the Middle East, dating back to about 42 AD. By the beginning of the Third Century, they comprised the majority of Egypt’s population. Many of them have left in recent years because of persecution. The highest share (of Christians in Egypt) reported in the past century was in 1927, when the census found that 8.3% of Egyptians were Christians. In each of seven subsequent censuses, the Christian share of the population gradually shrank, ending at 5.7% in 1996. Religion data has not been made available from Egypt’s most recent census, conducted in 2006. But in a large, nationally representative 2008 survey — the Egyptian Demographic and Health Survey, conducted among 16,527 women ages 15 to 49 — about 5% of the respondents were Christian. Thus, the best available census and survey data indicate that Christians now number roughly 5% of the Egyptian population, or about 4 million people. The Pew Forum’s recent report on The Future of the Global Muslim Population estimated that approximately 95% of Egyptians were Muslims in 2010. Religious tolerance is not a part of Koranic Islam. Infidels have to be converted or killed. Sharia Law takes precedence over any Constitution or law of the land. So I have a few questions. Why was a man who supports the Muslim Brotherhood in the Department of Homeland Security in America? Why are we importing ‘refugees’ who will not respect our Constitution and who believe that killing infidels is acceptable? Where will American Christians flee if our citizens elect people who support the persecution of Christians? How many of our government appointees from the last administration share the beliefs of Mohamed Elibiary? Even what we knew about the Iran deal at the time was questionable at best, but it keeps getting worse. Yesterday Politico posted an article about one aspect of the deal that somehow wasn’t covered by the press at the time. When President Barack Obama announced the “one-time gesture” of releasing Iranian-born prisoners who “were not charged with terrorism or any violent offenses” last year, his administration presented the move as a modest trade-off for the greater good of the Iran nuclear agreement and Tehran’s pledge to free five Americans. Sounds pretty innocent. But wait–there’s more to the story. Although President Obama described the seven as civilians, that is not actually true. But Obama, the senior official and other administration representatives weren’t telling the whole story on Jan. 17, 2016, in their highly choreographed rollout of the prisoner swap and simultaneous implementation of the six-party nuclear deal, according to a POLITICO investigation. Why in the world was President Obama so desperate to make a deal with Iran? Please follow the link above to the Politico article. It is a rather lengthy article, but has a lot of insight into the difficulties created by President Obama’s Iran treaty. The treaty not only will allow Iran to obtain a nuclear weapon in the near future (think North Korea). The treaty also creates immediate security and safety issues for American troops in the Middle East because of the large amounts of untraceable cash sent to Iran. That money can be used to support worldwide terrorism or to fund actions against American troops. We need to scrap the treaty and put the sanctions back! Another reason to leave the United Nations. The article points out that there are currently multiple threats to the United States worldwide. The global forces of instability are growing, especially in three parts of the world where regional peace and stability are particularly important to the U.S. The solidity of Europe, Asia and the Middle East is threatened by Russia, China, Iran, North Korea and the transnational Islamist threat spearheaded by al-Qaida and the Islamic State. Individually, none of these powers rise to the level of menace posed by the old Soviet Union. But when one of these threats acts up, we cannot expect the others to stand down. Indeed, we can expect them to try to exploit the situation. For that reason, the U.S. must have the capacity to deal with all of them at once, and here we have a problem. While we need to be able to respond globally, the Pentagon no longer has a global-size force. Because former President Obama chose to ignore the growing instability around the world, he did not prepare the United States to deal with it. The Heritage Foundation‘s annual Index of U.S. Military Strength objectively measures the ability of our armed forces to protect vital national interests in a multi-conflict scenario. And the measurement shows that, in terms of capacity, capability and readiness, the military has been in noticeable decline for years. In the 2017 index, the military’s overall ability to provide the hard power needed to prevail in a multi-conflict scenario was rated as “marginal.” Subsequent assessments suggest no change in the downward trend. It is time for Americans to realize that we have to take a really good look at our budget priorities. The time has come to go back to the budge priorities set by our Founding Fathers. The federal government was supposed to be weak, and the state governments were supposed to be strong. The federal government has no business being involved in either health insurance or education–those are state issues if individual states choose to deal with them. There are many areas that the federal government has taken control over that they have no constitutional right to be involved in. Our Founding Fathers never planned to have generations of families who never went to work a day in their lives because other Americans were supplying all of their needs. We have turned a helping hand into a crutch. That is not healthy for either the people receiving the handout or the people giving the handout. The government does not have the right to take money from people who earned it and give it to people who did not. In any other context that would be called robbery. Katie Pavlich posted an article at Townhall today about an investigative report done by CNN. The report states that the Venezuelan government has been issuing official passports in Iraq to anyone who is willing to pay for them–even if they have ties to terrorism. One confidential intelligence document obtained by CNN links Venezuela‘s new Vice President Tareck El Aissami to 173 Venezuelan passports and ID’s that were issued to individuals from the Middle East, including people connected to the terrorist group Hezbollah. The article at Townhall reminds us that Venezuela is a close ally of Iran. Iran is the backer and money behind Hezbollah. Until 9/11, Hezbollah was the most prevalent terrorist organization in the work, and before 9/11, responsible for more American deaths than any other terrorist organization. A dubious honor at best. ISIS, which has taken over large swaths of Iraq and Syria, has hundreds of millions of dollars at its disposal to purchase official passports. Additionally, the terror army has set up their own fraudulent passport system. President Trump recently signed an executive order barring all refugees and visas holders from seven countries, including Iraq and Syria, without proper vetting procedures. I think this report shows the wisdom of that ban. Victor Davis Hanson posted an article at Townhall.com today that pretty much sums up the political climate in America today. In his article, Mr. Hanson reminds us that Barack Obama ran for President on a moderate Democratic platform rather than a hard-left platform. Candidate Obama promised to balance the budget, oppose gay marriage, and pursue a bipartisan foreign policy. What he actually did was very different, and the media supported his actions. Soon, the border effectively was left open. Pen-and-phone executive orders offered immigrant amnesties. The Senate was bypassed on a treaty with Iran and an intervention in Libya. Political correctness under the Obama administration led to euphemisms that no longer reflected reality. Poorly conceived reset policy with Russia and a pivot to Asia both failed. The Middle East was aflame. The Iran deal was sold through an echo chamber of deliberate misrepresentations. The national debt nearly doubled during Obama’s two terms. Overregulation, higher taxes, near-zero interest rates and the scapegoating of big businesses slowed economic recovery. Economic growth never reached 3 percent in any year of the Obama presidency — the first time that had happened since Herbert Hoover‘s presidency. A revolutionary federal absorption of health care failed to fulfill Obama’s promises and soon proved unviable. Culturally, the iconic symbols of the Obama revolution were the “you didn’t build that” approach to businesses and an assumption that race/class/gender would forever drive American politics, favorably so for the Democrats. Those policies led to the defeat of Hillary Clinton in her presidential campaign. Donald Trump won the election, much to the dismay of the media and the Democratic party. So what did we get when we elected Donald Trump? We got a man who wants better trade deals and more jobs for Americans. We got a man who wants energy independence, secure borders, deregulation, tax reform. and traditional values. Sounds pretty basic to me. Yet securing national borders seems pretty orthodox. In an age of anti-Western terrorism, placing temporary holds on would-be immigrants from war-torn zones until they can be vetted is hardly radical. Expecting “sanctuary cities” to follow federal laws rather than embrace the nullification strategies of the secessionist Old Confederacy is a return to the laws of the Constitution. Using the term “radical Islamic terror” in place of “workplace violence” or “man-caused disasters” is sensible, not subversive. Insisting that NATO members meet their long-ignored defense-spending obligations is not provocative but overdue. Assuming that both the European Union and the United Nations are imploding is empirical, not unhinged. Questioning the secret side agreements of the Iran deal or failed Russian reset is facing reality. Making the Environmental Protection Agency follow laws rather than make laws is the way it always was supposed to be. Unapologetically siding with Israel, the only free and democratic country in the Middle East, used to be standard U.S. policy until Obama was elected. Issuing executive orders has not been seen as revolutionary for the past few years — until now. Please follow the link above to read the entire article. It applies common sense to what the media chooses to misreport. In sum, Trump seems a revolutionary, but that is only because he is loudly undoing a revolution. Yesterday the U.K. Mail posted an article about President Obama’s plan to release at least eighteen more Guantanamo detainees before he leaves office in two weeks. Four of those detainees will be sent to Saudi Arabia, not exactly a hotbed of moderate Islam. Obama will likely focus on moving detainees who have been ‘cleared for transfer’ – a group that includes the alleged head of al Qaeda‘s bomb-manufacturing operation in eastern Afghanistan, the head of al Qaeda’s Tunisian faction in Afghanistan, and senior weapons trainers. Those held in Guantanamo in recent years have been dubbed ‘the worst of the worst’ by military and intelligence officials. …The list of ‘recommended for transfer’ prisoners includes a number of top al Qaeda operatives and commanders. …Some of the recommended transfers have also vowed to return to jihad if they are ever released, according to reports from US military officials. They have also threatened to assassinate the U.S. president, kill American citizens, and attack other world leaders who are allied with the West. Please follow the link above to the article. The article includes a list and details of the prisoners now cleared for release. Anyone with an eye toward national security should be appalled by that list–these prisoners include an expert bomb-maker and others who are skillful at planning terrorist attacks. If they were run-of-the-mill prisoners who had done the things they had done other than in the context of terrorism, they would never be let out of prison, so why is President Obama so anxious to set them free? There is little doubt about their crimes and tendency to continue in terrorism. In World War II, they would have been tried in a military tribunal and executed. In America, they would have been sentenced to life without parole. How would an American who had purposefully killed innocent Muslims be treated by the Saudis, the Iranians, the Afghans? Would he be treated humanely? Would his religious dietary requirements be met? Would he be given tennis courts? How long would he stay alive? Guantanamo serves a purpose. Intelligence sources outside of the Obama Administration have stated that the recidivism rate among Guantanamo prisoners who have been released is probably higher than thirty percent. We need to remember that many of these terrorists have been trained in terrorism from a young age (see THE BLOOD OF LAMBS by Kamal Saleem). Terrorism is all they know how to do. It is unrealistic to believe that they can be retrained. The culture they have been raised in is brutal, and that culture has become part of who they are. To ask a country such as Saudi Arabia, which is steeped in that culture, to retrain them is ridiculous. That’s like sending a thief to a pickpocket convention to learn how to make a living. He might not learn the lesson you wanted him to learn. The actions of President Obama as he leaves office make the world less safe for all of us. There are no words to describe fully what the Obama Administration did at the United Nations this week. The Obama Administration is already briefing friendly press organizations that they’re showing no animus toward the Jewish state in refusing to veto the resolution. Rather, it’s “tough love”: for an Israel that seems not to have the will or vision to take chances for peace. What really concerns me about this resolution is the idea that building homes in the Jewish Quarter of Jerusalem is illegal. This resolution will not bring peace–it will encourage more violence on the part of those who want to see Israel destroyed. For evidence of the success of ‘land for peace’ all you have to do is look at the Gaza Strip, now a launching pad for launching rockets at civilians in Israel. In my opinion they have not lived up to their charter and need to be disbanded. Where is the outcry about the killing of Christians in the Middle East and Africa? Where is the outcry against the subjugation of women in Saudi Arabia? Where is the outcry against the killing of homosexuals in Iran? It is truly time for the United Nations to go away. Meanwhile, I hope the Trump Administration will either undo what has just been done or else simply defund the United Nations. The Obama administration agreed to back the lifting of United Nations sanctions on two Iranian state banks blacklisted for financing Iran’s ballistic-missile program on the same day in January that Tehran released four American citizens from prison, according to U.S. officials and congressional staff briefed on the deliberations. The U.N. sanctions on the two banks weren’t initially to be lifted until 2023, under a landmark nuclear agreement between Iran and world powers that went into effect on Jan. 16. The U.N. Security Council’s delisting of the two banks, Bank Sepah and Bank Sepah International, was part of a package of tightly scripted agreements—the others were a controversial prisoner swap and transfer of $1.7 billion in cash to Iran—that were finalized between the U.S. and Iran on Jan. 17, the day the Americans were freed. If the Iran nuclear deal is such a wonder thing, why has so much of it been kept secret? The Middle East was in relatively good shape when President Obama took office. Hillary Clinton was his Secretary of State. Eight years later, where are we? In 2011 we saw the birth of the ‘Arab Spring’ which was supposed to democratize the Middle East. The Arab Spring brought the Muslim Brotherhood to power in Egypt, destabilized Libya, and eventually led to the civil war in Syria. Egypt (with no help from the Obama Administration) was able to wrestle its country back from the Muslim Brotherhood and install leadership that will fight the Muslim Brotherhood and terrorism. It’s far from a democracy, but it is keeping peace within the country and working to stop terrorism. I am not impressed with the Obama Administration’s foreign policy under the leadership of Secretary of State Clinton. We have consistently worked against freedom, and we have funded terrorism by giving money to Iran. Please follow the link above to read the entire Wall Street Journal article. The foreign policy of the Obama Administration has been a nightmare for America. Electing Hillary Clinton as President will give us more of the same. And this circus continues at UNESCO. UNESCO, the UN body charged with preserving world heritage. Now, this is hard to believe but UNESCO just denied the 4,000-year connection between the Jewish people and its holiest site, the Temple Mount. That’s just as absurd as denying the connection between the Great Wall of China and China. …We will not accept any attempt by the UN to dictate terms to Israel. The road to peace runs through Jerusalem and Ramallah, not through New York. Israel is one of the few nations in the Middle East that is actually working toward peace. The United Nations is not helping that effort. You can read the entire speech here. I have always believed that the best way to get information on a speech is to read the transcript. Yesterday Donald Trump made a speech on foreign policy. Politico posted the text of the speech. I am not going to post the whole thing, but I am going to post some excerpts with some of my comments. Today we begin a conversation about how to Make America Safe Again. In the 20th Century, the United States defeated Fascism, Nazism, and Communism. Now, a different threat challenges our world: Radical Islamic Terrorism. This summer, there has been an ISIS attack launched outside the war zones of the Middle East every 84 hours. Mr. Trump then lists a number of terrorist attacks that have occurred in the United States in recent years. Nor can we let the hateful ideology of Radical Islam – its oppression of women, gays, children, and nonbelievers – be allowed to reside or spread within our own countries. We will defeat Radical Islamic Terrorism, just as we have defeated every threat we have faced in every age before. But we will not defeat it with closed eyes, or silenced voices. Anyone who cannot name our enemy, is not fit to lead this country.Anyone who cannot condemn the hatred, oppression and violence of Radical Islam lacks the moral clarity to serve as our President. The rise of ISIS is the direct result of policy decisions made by President Obama and Secretary Clinton. Mr. Trump then listed the Middle Eastern and Northern African countries in which the Obama-Clinton team encouraged revolutions. None of these revolutions have turned out well, and all have made the world less safe for everyone. In all of the decisions to overthrow stable governments, there were not adequate plans to deal with the vacuum that the overthrow created. ISIS has spread across the Middle East, and into the West. In 2014, ISIS was operating in some 7 nations. Today they are fully operational in 18 countries with aspiring branches in 6 more, for a total of 24 – and many believe it is even more than that. The situation is likely worse than the public knows: a new Congressional report reveals that the Administration has downplayed the growth of ISIS, with 40% of analysts saying they had experienced efforts to manipulate their findings. At the same time, ISIS is trying to infiltrate refugee flows into Europe and the United States. 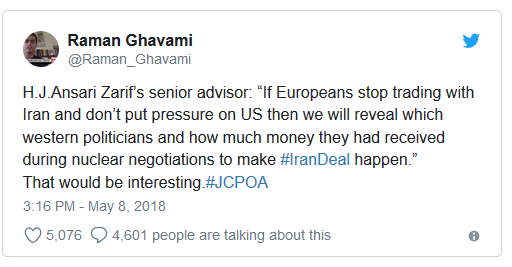 Iran, the world’s largest state sponsor of terrorism, is now flush with $150 billion in cash released by the United States – plus another $400 million in ransom. Worst of all, the Nuclear deal puts Iran, the number one state sponsor of Radical Islamic Terrorism, on a path to nuclear weapons. In short, the Obama-Clinton foreign policy has unleashed ISIS, destabilized the Middle East, and put the nation of Iran – which chants ‘Death to America’ – in a dominant position of regional power and, in fact, aspiring to be a dominant world power. If I become President, the era of nation-building will be ended. Our new approach, which must be shared by both parties in America, by our allies overseas, and by our friends in the Middle East, must be to halt the spread of Radical Islam. All actions should be oriented around this goal, and any country which shares this goal will be our ally. We cannot always choose our friends, but we can never fail to recognize our enemies. As President, I will call for an international conference focused on this goal. We will work side-by-side with our friends in the Middle East, including our greatest ally, Israel. We will partner with King Abdullah of Jordan, and President Sisi of Egypt, and all others who recognize this ideology of death that must be extinguished. We will also work closely with NATO on this new mission. I had previously said that NATO was obsolete because it failed to deal adequately with terrorism; since my comments they have changed their policy and now have a new division focused on terror threats. To be honest, I wish nation building worked. I wish we could go into a country, get rid of the tyrants, and help everyone set up a government where they would be free and equal. Unfortunately, reality keeps getting in the way of doing that. 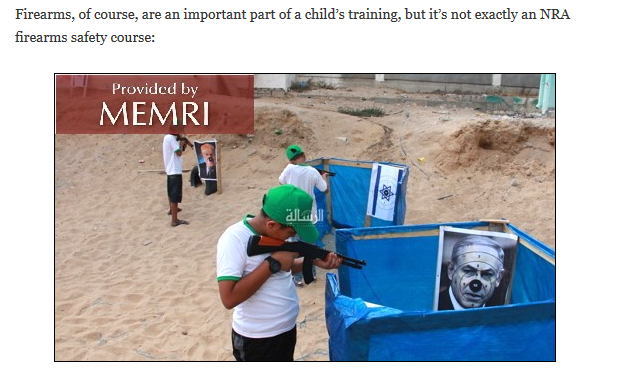 On Sunday I posted an article about jihadist training of children that is going on in Gaza summer camp. Camps like this are a serious obstacle to any sort of lasting peace in the Middle East (and an obstacle to ending terrorism). Just as we won the Cold War, in part, by exposing the evils of communism and the virtues of free markets, so too must we take on the ideology of Radical Islam. While my opponent accepted millions of dollars in Foundation donations from countries where being gay is an offense punishable by prison or death, my Administration will speak out against the oppression of women, gays and people of different faith. Our Administration will be a friend to all moderate Muslim reformers in the Middle East, and will amplify their voices. This includes speaking out against the horrible practice of honor killings, where women are murdered by their relatives for dressing, marrying or acting in a way that violates fundamentalist teachings. Shockingly, this is a practice that has reached our own shores. To defeat Islamic terrorism, we must also speak out forcefully against a hateful ideology that provides the breeding ground for violence and terrorism to grow. A Trump Administration will establish a clear principle that will govern all decisions pertaining to immigration: we should only admit into this country those who share our values and respect our people. In the Cold War, we had an ideological screening test. The time is overdue to develop a new screening test for the threats we face today. In addition to screening out all members or sympathizers of terrorist groups, we must also screen out any who have hostile attitudes towards our country or its principles – or who believe that Sharia law should supplant American law. Those who do not believe in our Constitution, or who support bigotry and hatred, will not be admitted for immigration into the country. Only those who we expect to flourish in our country – and to embrace a tolerant American society – should be issued visas. To put these new procedures in place, we will have to temporarily suspend immigration from some of the most dangerous and volatile regions of the world that have a history of exporting terrorism. As soon as I take office, I will ask the State Department and the Department of Homeland Security to identify a list of regions where adequate screening cannot take place. We will stop processing visas from those areas until such time as it is deemed safe to resume based on new circumstances or new procedures. The size of current immigration flows are simply too large to perform adequate screening. But just like we couldn’t defeat communism without acknowledging that communism exists – or explaining its evils – we can’t defeat Radical Islamic Terrorism unless we do the same. This also means we have to promote the exceptional virtues of our own way of life – and expecting that newcomers to our society do the same. Pride in our institutions, our history and our values should be taught by parents and teachers, and impressed upon all who join our society. Assimilation is not an act of hostility, but an expression of compassion. Our system of government, and our American culture, is the best in the world and will produce the best outcomes for all who adopt it. This approach will not only make us safer, but bring us closer together as a country. Renewing this spirit of Americanism will help heal the divisions in our country. It will do so by emphasizing what we have in common – not what pulls us apart. This is my pledge to the American people: as your President I will be your greatest champion. I will fight to ensure that every American is treated equally, protected equally, and honored equally. We will reject bigotry and oppression in all its forms, and seek a new future built on our common culture and values as one American people. Only this way, will we make America Great Again and Safe Again – For Everyone. I don’t know how much of this speech the media will actually quote or how they will report it, but to me, this speech represents a very common sense approach to foreign policy and terrorism. This does not sound like the ranting maniac that the press is attempting to make Donald Trump out to be. I think we need more websites posting transcripts of speeches and less commentary by a biased press. 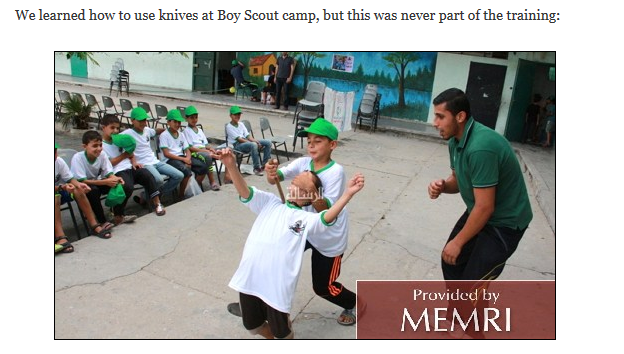 John Hinderaker posted an article at Power Line yesterday about summer camp in Gaza. 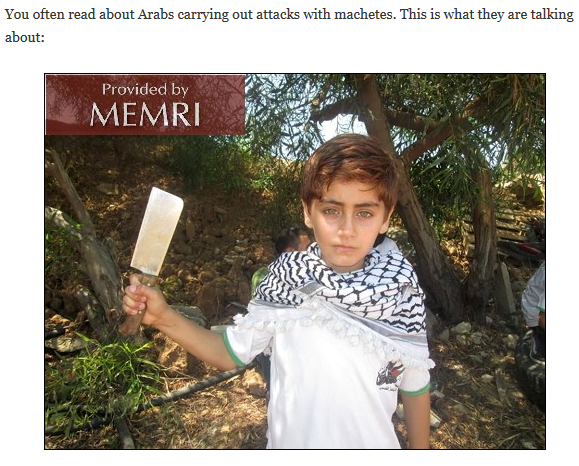 The article includes pictures of the camp activities that are going on under the supervision of Hamas’s Izz Al-Din Al-Qassam Brigades. Look at the age of these children. It should break your heart that they are being robbed of their innocence and taught to hate. I recently read The Blood of Lambs by Kamal Saleem. Kamal Saleem was recruited by the Muslim Brotherhood in Lebanon at the age of seven and trained as a terrorist. As a child, he was sent on suicide missions that he miraculously survived. He came to America to commit terrorism in America. The book tells the story of his training and his mission, and explains why he is no longer involved with the Muslim Brotherhood or in terrorism. The book illustrates the problem and gives the answer to the problem. However, until we stop funding children’s camps in Gaza and other places that train young jihadists, we will not see peace in the Middle East.